ClotCare provides the following links and descriptions because we think that these sites may be useful to you. ClotCare does not have an affiliation with any of these sites. ClotCare does not have any influence or control over the content, the terms and conditions, or the privacy statements of these sites. Advanced Cardio Services is a vendor of PT-INR testing devices and supplies and will work with a patient's insurance to secure coverage of self-testing supplies. Alere Home Monitoring, Inc. provides meters, supplies and training for patients to self-test at home. The Alere INRatio®/INRatio®2 PT/INR Monitoring Systems are handheld blood coagulation systems for monitoring patients taking warfarin. These devices are used by healthcare professionals and patients at home. The American College of Chest Physicians (ACCP) is a medical specialty society of physicians, surgeons, allied health professionals, and individuals with PhD degrees who specialize in diseases of the chest: pulmonology, cardiology, cardiovascular and cardiothoracic surgery, hypertension, critical care medicine, and related disciplines. The American Heart Association is a national voluntary health agency whose mission is to reduce disability and death from cardiovascular diseases and stroke. Their website has a variety of patient education materials. The Anticoagulation CME Guide maintains a list of CME opportunities in the fields of anticoagulation and atrial fibrillation. The Anticoagulation CME Guide is supported by an educational grant from AstraZeneca. AntiCoagulation Europe is a charity providing information and advice to people on oral anticoagulation therapy. AntiCoagulation Europe was founded in 2000. Nearly everyone involved with the charity is on anticoagulant therapy. The Anticoagulation Forum is an organization of anticoagulation clinics in North America. One of the features of this site is a directory that will allow you to search for an anticoagulation clinic/specialist in your area. The APS Foundation of America maintains a website with information on antiphospholipid antibody syndrome and related issues. Their mission: The APS Foundation of America, Inc. is dedicated to fostering and facilitating joint efforts in the areas of education, public awareness, research, and patient services in an effective and ethical manner. This website has information on Argatroban and HIT, including case studies and abstracts. Note that this site is provided by GlaxoSmithKline, the manufacturer of the drug. According to the site, the resources provided are intended for US healthcare professionals only. This website provides information on hereditary antithrombin deficiency and a clinical trial currently being conducted by GTC-Biotherapeutics, Inc. This website was developed by GTC-Biotherapeutics, Inc.
BloodLine is a good resource for healthcare professionals. The site provides publications on topics relating to hematology and oncology. This website from Cedars-Sinai Medical Center provides extensive data on a wide variety of prosthetic heart valves. Circulation is the Journal of the American Heart Association. The journal has special publications written for patients. Click here to go to the Cardiology Patient Page on the website of Circulation. Clintrialresults.org maintains a database of slide presentations on clincal trial results. The slides are available for download and there is no cost for use of the site. Clot Connect is an education and outreach project led by the University of North Carolina at Chapel Hill's Blood Clot Outreach Program. This "practical guide to evaluation and improvement" by Frederick A. Anderson, Jr, PhD and Anne-Marie Audet, MD, MSc, FACP covers best practices for evaluation, prevention, and treatment of deep vein thrombosis (DVT). The website is provided by the Center for Outcomes Research - University of Massachusetts Medical School. This web page provides information on valves with nice color pictures and a focus on valves that are commonly used today. It is a valuable resource for health care professionals, and general users may also find the pictures and other information useful. Foryourlegs.com is a Michigan retailer that sells graduated compression stockings online. Foryourlegs.com has offered to give ClotCare visitors free shipping on any order of $25 or more. Enter "clotcare" as your coupon code when checking out to take advantage of this offer. Please note that ClotCare is not affiliated with nor financially compensated by Foryourlegs.com. This website is run by a patient who has Factor V Leiden (FVL). This support site has information on FVL and other hypercoagulable conditions, but it is worth noting that not all of the information presented comes from healthcare professionals. As with all websites we link to, ClotCare does not have any control over the content of the FVL website and cannot confirm that all information provided by it is accurate. HSAG has created a VTE Resource Kit with the goal of "develop[ing] and pilot test[ing] quality improvement tools and strategies that will improve providers' adherence to guidelines for VTE risk-assessment and appropriate prophylaxis for medical patients." This project is funded by sanofi-aventis, US, LLC. HealthyLegs.com is an Oregon retailer that sells graduated compression stockings. HealthyLegs.com has offered to give ClotCare visitors 15% off online purchases. Enter "ClotCare" as your coupon code when checking out to take advantage of this offer. 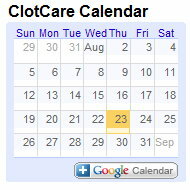 Please note that ClotCare is not affiliated with nor financially compensated by HealthyLegs.com. The Hemophilia & Thrombosis Research Society is a research organization whose primary purpose is to facilitate basic science and clinical research endeavors specific to hemophilia and related coagulation disorders. INRSelfTest.com is a site created by Philips Healthcare. Philips Healthcare is one of several companies that provide PT-INR self-testing services, which make it possible for patients taking Coumadin (warfarin) to test their PT-INR levels at home. The service from Philips Healthcare includes patient training, use of precision "fingerstick" meter, all required supplies, record-keeping and immediate notification of patient's healthcare provider if required. The Institute for Safe Medication Practices (ISMP) is a nonprofit organization devoted entirely to medication error prevention and safe medication use. ISMAAP aims to give patients continuous support about life on oral anticoagulation therapy and to motivate them to carry out self-monitoring to reduce the potential risks of thrombosis and haemorrhage. ITC manufactures point of care testing devices, including fingerstick testing devices for the PT-INR Test. INvestigators Against ThromboEmbolism (INATE) is an educational website that aims to improve the worldwide management of patients with venous thromboembolism (VTE). The site, which is funded by sanofi-aventis, has resources for physicians and patients. Registration is required to access the physician resources. JCAHO Mission: To continuously improve the safety and quality of care provided to the public through the provision of health care accreditation and related services that support performance improvement in health care organizations. This link provides access to a number of short and entertaining videos on a wide array of key topics on heart disease prevention and management. The topics range from measures to prevent heart disease, how to recognize symptoms of heart disease, how to provide CPR, the importance of diet and exercise, and more. Almost all of the videos are produced at the patient level of complexity; but health care professionals may find the videos to be excellent for patient education activities. The viewer should also be aware that several of the videos are from European sources where some of the terminology and recommendations may be different than what one might encounter in the U.S. For example, reference to GTN appears to be referring to nitroglycerine which in the U.S. is often referred to as NTG. Also, one video recommends that daily alcohol intake be limited to 3 or 4 "units" in males (2 or 3 "units" in women) while in the U.S. the usual recommendation is a limit of 2 "drinks" in males and 1 "drink" in women. This organization in the UK aims "to 'Stop the Clots' through a programme of education and research." They also support National Thrombosis Week in the UK. The National Blood Clot Alliance (NBCA) is a nationwide community-based patient advocacy organization. NBCA's mission is to prevent, diagnose and treat thrombosis and thrombophilia through research, education and advocacy. NBCA programs include patient education, healthcare professional training, and public awareness. NBCA emphasizes patient and public awareness about the signs, symptoms and prevention of blood clots; and, promotion of optimal treatment for blood clots and clotting disorders. In order to optimize the care of patients receiving anticoagulant therapy, the mission is to develop, maintain and protect the Certified Anticoagulation Care Provider (CACP) credential and the certification process. The National Quality Forum (NQF) is a private, not-for-profit membership organization created to develop and implement a national strategy for healthcare quality measurement and reporting. The North American Thrombosis Forum exists to support novel research projects and innovative educational programs, to work on public policy and advocacy related to thrombosis issues, and to ensure excellent training of future leaders in the field. This site has a search feature that returns information on foods high (or low) in vitamin K.
The 1-800-NO-CLOTS service is a free consultative service for physicians worldwide on pediatric thromboembolism and stroke. While the phone service is for clinicians only, the website has useful information on pediatric thromboembolism and stroke for both clinicians and parents of children with blood clots. PreventPTS.org is a resource of the University of Utah School of Medicine. The site provides CME opportunities for healthcare providers on post-thrombotic syndrome as well as post-thrombotic syndrome educational resources for patients. PTINR.com is a website from Alere Home Monitoring, Inc., a company that provides meters, supplies and training for patients to self-test at home. The site has educational information for both patients and healthcare providers about healthy living on warfarin. The PHA mission is to find ways to prevent and cure pulmonary hypertension (including chronic thromboembolic pulmonary hypertension), and to provide hope for the pulmonary hypertension community through support, education, research, advocacy and awareness. Rejuvahealth markets itself as a company that sales fashionable compression stockings. The San Francisco Vein Center provides helpful information on DVT, varicose veins, arterial conditions and different treatments for all of the conditions. The center is run by a vascular surgeon, Melinda L. Aquino, MD. StopDVT.org is a UK-based organization created with the stated purpose of DVT prevention by education, research, advice, and lobbying. ThrombosisClinic.com is a continuing medical education resource for health care professionals emphasizing the latest in emerging approaches in the diagnosis, treatment, and prevention of thrombosis. Thrombosis-Consult.com has a lot of good resources for healthcare professionals, including free CME opportunities. Thrombosis Interest Group of Canada (T.I.G.C) is dedicated to furthering education and research in the prevention and treatment of thrombosis. The website provides information in both English and French. The Trip Database is a free medical search engine. The medical image search and patient leaflet search are especially useful for patients. The UIC Office of Continuing Education and Meeting Services-Programs offers a number of continuing education opportunities relating to anticoagulation and antithrombotic therapy. The U.S. Website for Lovenox is provided by Aventis, the maker of Lovenox. This site has information for healthcare professionals and for patients/caregivers. The Vascular Disease Foundation (VDF) is a national public non-profit organization focused on vascular diseases with the sole purpose of providing public education and improving awareness about vascular diseases. Statement from Venousdisease.com: This is an educational site devoted to research and clinical aspects of venous disease, including such topics as varicose veins, venous thromboembolism, chronic venous insufficiency and anticoagulation issues. It is intended to be an extension of the educational efforts of the Department of Surgery at Evanston Northwestern Healthcare. This Website contains multiple evidence-based tools called the VTE Safety Toolkit, for the prevention, diagnosis, and treatment of venous thromboembolism (VTE). VTEconsultant.com is focused on raising the level of urgency around prevention of venous thromboembolism (VTE) in patients undergoing total hip or knee replacement surgery, this site offers the latest VTE-related news, information, expert opinions, and relevant clinical data. In addition, users can sign up for VTEConsultant e-mail alerts, and access video content, a calendar of upcoming events, and links to several relevant Web sites.